James Cohan Gallery is pleased to announce the first New York solo exhibition of Hiraki Sawa. 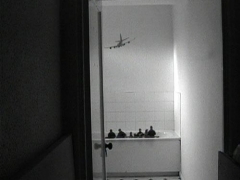 He will present four new videos: Migration, Elsewhere, Spotter, and Airliner. Each video is a poetic mediation on the idea of dislocation and displacement. 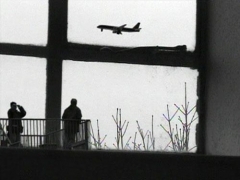 The juxtapositions, which he creates with simple video editing techniques, recall earlier Surrealist's collages. 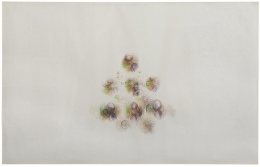 However, Sawa's focus is on an ever-shifting terrain of our own existence in the modern age. The ease of world travel allows one to move from culture to culture seamlessly. The airplane and re-animations of Eadweard Muybridge's locomotion studies become Sawa's metaphors for change, evolution, and alienation. Dwelling, an earlier video by Hiraki Sawa, is exhibitionsly on view in Times Square, presented by Creative Time's The 59th Minute: Video Art on the Times Square Astrovision. This work can be viewed at One Times Square on the large monitor every fifty-ninth minute of every third hour. Sawa, who is from Kanazawa, Japan, has lived in London for the last eight years. He recently graduated from the master's program at the Slade School of Art, University College in London. 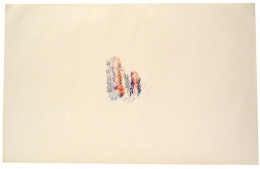 His work was included in the 2003 Lyon Biennial, Lyon, France. 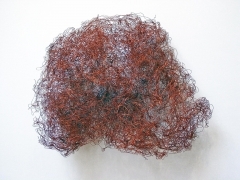 The James Cohan Gallery is pleased to announce the opening of an exhibition of sculptures and drawings by Alan Saret. 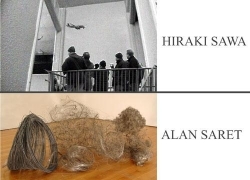 Alan Saret's sculptures are malleable, shrub-like bundles of wire that sit on the floor, hang from the wall, or most notably, are suspended from the ceiling. The works featured in this exhibition span from 1967 to the late 1980s. His sculptures and drawings are process-based, referring to their own making, and address the critical idea of creating volume rather than mass. The combined airiness and complexity of the work reveals its mode of creation and seems deceptively open to view, but on closer inspection present an intensity and attention to rigorous detail. Because the sculptures are not rigid they have an ability to gently change in form over time. 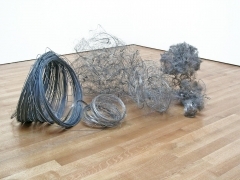 The acceptance of the mutable quality of the material was embraced by several artists of Saret's generation, including Lynda Benglis, Eva Hesse and Richard Serra, in the late 1970s and early 1980s as a way to draw connections between nature and art. Saret's sculptures in effect reinvigorate the notion of drawing in space. 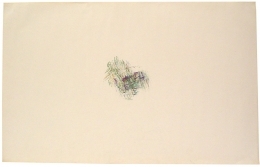 His drawings, while not preliminary studies for his three-dimensional work, are created in tandem and further express a strong atmospheric, transient and lyrical quality. Saret was born in New York City on 25 December 1944. He received a bachelor's degree in architecture from Cornell University (1966) and subsequently studied with Robert H Morris at Hunter College (1966-68). As Saret's sculpture began to increase in scale and complexity, he began exhibiting outside the commercial gallery network. 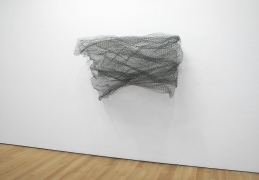 Major exhibitions of which have included or featured his work are The New Sculpture 1965-1975: Between Geometry and Gesture at the Whitney Museum of American Art and Alan Saret: Matter into Aether and the Newport Harbor Museum among others. His work is included in numerous public collections including The Museum of Modern Art, New York; The Whitney Museum of American Art, New York; The Detroit Institute of Arts; and the Art Gallery of Ontario, Toronto.